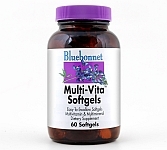 Bluebonnet’s Multi-Vita™ Softgels is a two-a day multivitamin and multimineral dietary supplement available in easy-to-swallow softgels. Directions: As a dietary supplement, take 2 softgels daily. Preferably with meals. Free Of: milk, egg, fish, crustacean shellfish, tree nuts, peanuts, wheat, yeast, gluten, barley, rice, sodium and sugar. r ingredients: Gelatin, glycerin, water, soy oil, carob, beeswax.